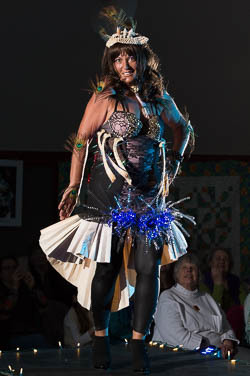 The 11th annual Valley Arts Alliance Wearable Art and Runway Fashion Show was performed at the Palmer Depot, with both a 3pm Matinee and a 7pm Evening performance. 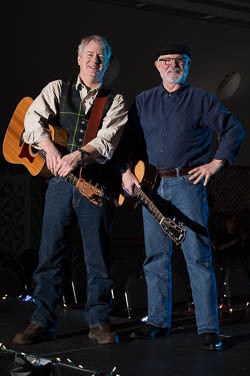 The 3pm Matinee was opened by John Stroup and Tim Grady. 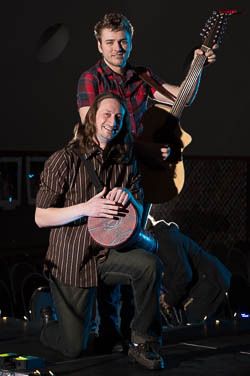 The 7pm Evening performance was opened by The Jerry Wessling Band, consisting of Jerry Wessling and Michael Consalo. 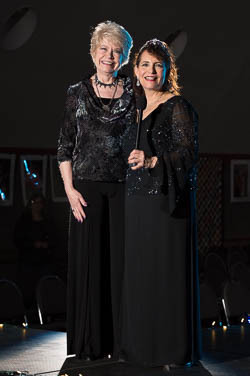 Pam Huyck and Hillary Saffran served as Masters of Ceremony. Both performances were sold out! 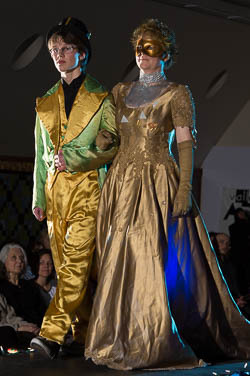 Carmen Summerfield and Tino Jordan opened the show dressed in gold! Tino is wearing a suit made by Bill Tull's mother for his dad, John. This is a minstrel show performer costume, used in Philadelphia in the late 1930's. This suit, and the Tull family, came to Alaska in the late 1950's. 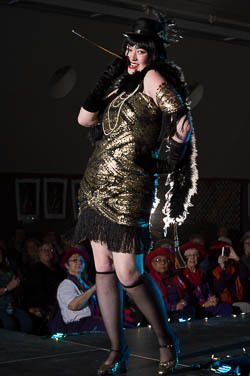 Linda designed and produced this late 1920s inspired creation from scratch for the 2016 Valley Performing Arts (VPA) fundraiser "Roaring 20s." Jazzed up with electroswing this is one hot mama! Apologies to Irving Berlin and Fred Astaire. Mr. Clean always dreamed of space travel, so off on the Starship Enterprise he went. Leaving YOU to clean your own house and everything in it! But when the Borg boarded the Enterprise, Resistance Was Futile. 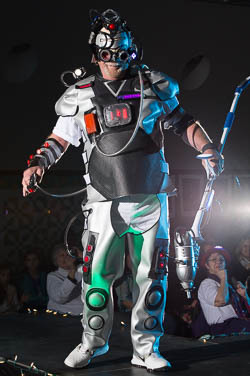 Mr. Clean was assimilated… So how do you like him now? Another tarp and tape original by Niki Pease! This piece was sponsored by AK USA Federal Credit Union and the Valley Arts Alliance for the 2016 Palmer Chamber of Commerce fund raiser “Wandering Waters”. 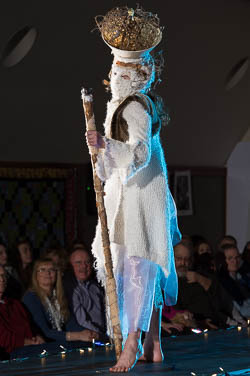 Since then it has appeared at the Valley Arts Alliance production AK Home Companion and will appear at more events in the Valley.. 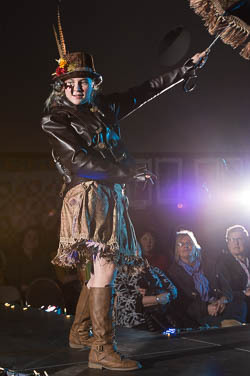 Teen Steampunkster! Made from lots of repurposed items. This is a T’N’T (Tarp ‘N’ Tape) rendition of a Valley Valkyrie. In Norse mythology Valkyries are winged helpers of Odin, bringing fallen warriors to Valhalla, the final odyssey. EIR (pronounced AIR) means peace, health, or mercy. A special effort was made to obtain the digital camouflage tarp… Thanks, Sister! These women make legends come to life. We have an Orca legend and several Raven legends, big and small, all created by emptying the drawers of Pam’s craft room. Formal wear “fur” a “night out” of fishing. She lives in the woods, and seduces with Turkish delight. 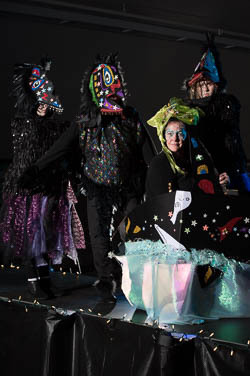 A fusion of New York City Fashion Week and Maurice Sendek’s children’s book, “Where the Wild Things Are”, elements of faux and fantasy merge made of recycled plastic & paper materials. Inspired by Homer’s Odyssey, which featured Ulysses and Penelope. Margret and Rod met many years ago in an artists’ village in the Carmel Hills of Israel overlooking the Mediterranean. They danced to Greek music at a wedding and fell in love. They have a big family in Israel and in Alaska. The music is Greek, the lyrics are in Hebrew, and the title is “These Eyes of Mine”. For Margret and Rod life together has been a wonderful Odyssey. 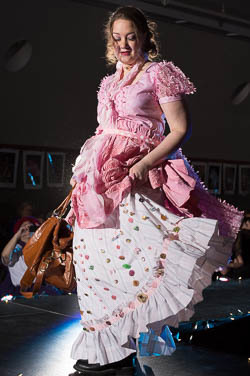 Balloon artist Gabriel Camacho is shaking things up by combining a balloon dress with length and elegance for Jasmin to dance to the beat as she displays her love for fun fashion and upbeat music. 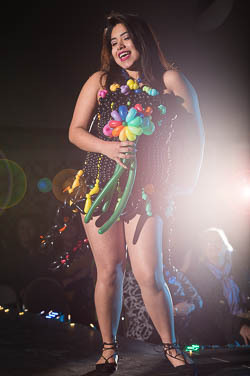 This work of wearable art goes to show that balloon twisting can be used for more than just the traditional making of balloon animals by creating something wearable, fashionable and fun! Under the sea- If only I had a multi-level underwater grotto in which to store and display my perpetually incomplete collections of gizmos and gadgets, who-zits and what-nots. These pieces flow from my affinity for the ocean, and my hoard of interesting, shiny things, and found objects, both natural and person-made. 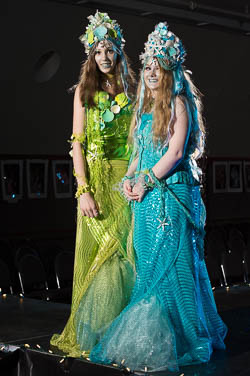 These outfits are made primarily from recycled materials, much of it donated by the Valley Community for Recycling Solutions, collected at their facility on 49th State Street. 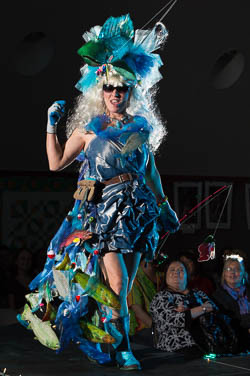 You'll see yards of recyclable plastic bubble wrap, and lots of bottle caps, pull tabs, shells, and myriad beads and baubles collected and sent from around the world. Keeping with recycled materials and a budget, this over the top creation made from lace, mylar, sateen panne crystals, and flash, was inspired from watching the Series Versailles, Tudors and Venice Carnival. Any occasion to dress up and get Phancy. I would have enjoyed the elegant entertaining and the ballroom dancing. 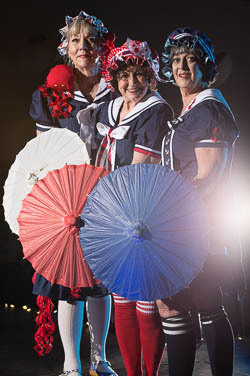 If these bathing beauties look familiar, it's because you saw them last year in different attire. 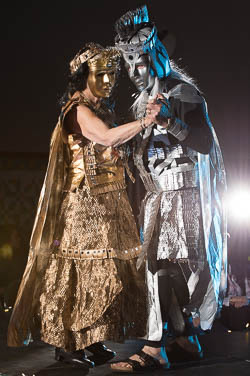 Designer Ginny Lawton has updated their apparel by a few millennia. They lodge in 1914 when the song "By the Beautiful Sea" first appeared. Each bather has adorned her attire as she deemed appropriate, but an obvious maritime theme persists with sea creatures and anchors. 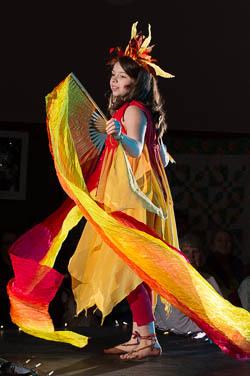 Paper parasols complete the ensemble that bathers would have taken to the seaside. Rest assured that next year they don't plan to update the look by thirty years with the 1946 advent of the bikini. Copper and leather are the materials of choice. 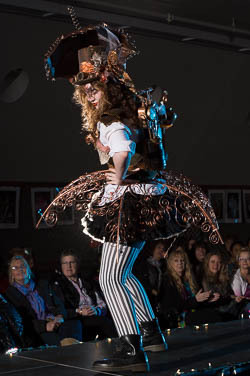 Embellished with parts, gadgets and gears, this is truly a Steampunk Spiral Fantasy. Viva the Revolution! Designer Ginny Lawton believed this song the perfect means to divest herself of buttons. Buttons that belonged to her grandmother, her mother, and herself. Last year her grandmother's handkerchiefs found a new purpose in adorning an ensemble. This year, buttons would find a new home and the button box would be reduced in quantity. All of that might have come to pass had she not found that there are wonderful vintage and decorative buttons for sale on eBay. Now she has more buttons than ever, but some of the more interesting ones are sewn on model Michelle Spiegle-Freeman's skirt: cats, flowers, Czech glass, cameos, and of course Michelle's favorite bird, the owl. You'll note that model Michelle does a better job of divesting herself of unwanted articles than did the designer. 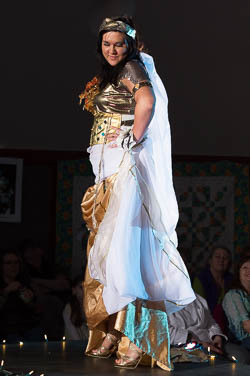 A Greek Odyessy inspired costume full of confidence, strength and items you can find around your house. Entirely donated items include a bed sheet, belt buckle, fake leaves, clip on earrings and a purse. A dress created for a 1950's themed wedding needed to come out of the closet. What better place than for Wearable Art, especially after Kate noticed the huge quantity of lace among her mother's sewing notions. 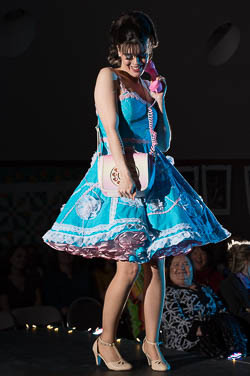 The lace offered the perfect opportunity to revisit the Big Bopper's 1958 hit, Chantilly Lace. 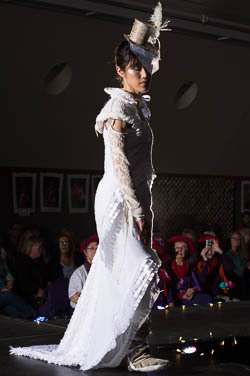 The recycled lace made stunning rosettes, and additional trim and buttons complete the look. The find of a phone purse in appropriate colors capped the deal. 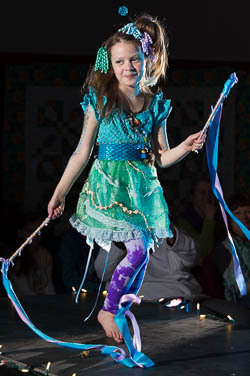 This "big-eyed girl" delights in bopping her ponytail down the runway. A crown of seashells and rhinestones begins this JOUR-KNEE. 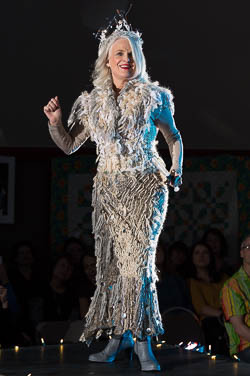 Steam punk breast plate, adorned with the ribs from a fallen moose, is the foundation for this expressive UP cycled original gown. 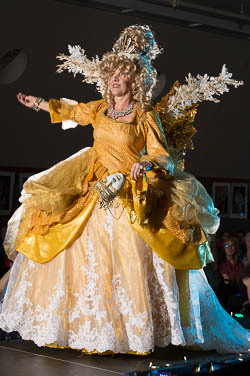 Plastic water bottles, feathers, jewels, paper mache, and domestic mini lighting cascades into the flounce made of 2 liter soda bottles, creating an awning over the skirt of wall paper, bedazzled moose bones and lace. Black leggings, suitable for any Odyssey, are tucked inside black booties lit with Swarovski Crystals. 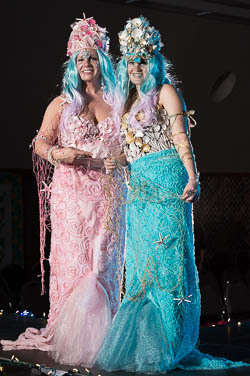 Every girl secretly wants to be a Mermaid, so girls, imagine this could be you on this underwater runway! Continuing the previous act, the mermaids have fallen in love, and as we all know, a mermaid’s love life is very complicated. No matter the season, Alaska always seems to be adorned in something pure and pristine. A gown of glittering snow, a bouquet of Devil’s Club and Yarrow flowers, a veil of wispy Cottonwood seeds. These elements inspired us to present to you Alaska as a bride. 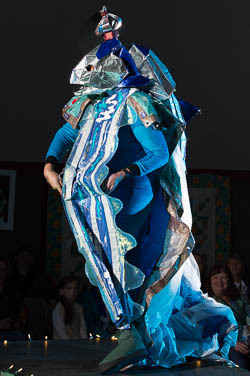 The dress is embellished with trapunto quilting to represent the snow shadow. 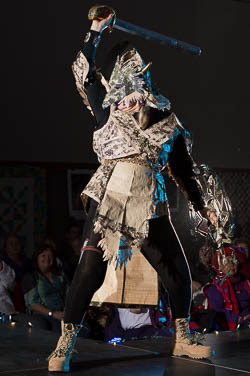 The top hat is made from real birch bark from a fallen tree. The mukluk inspired boots are vegan and gluten free. We give you an image of our eternally pure and glorious state. 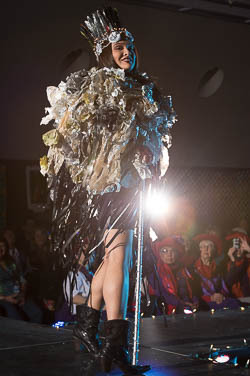 Inspired by fire, created from repurposed and recycled materials. 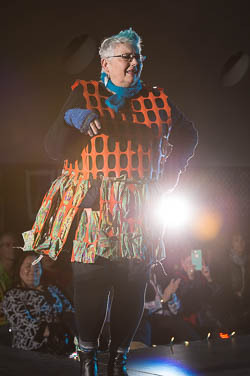 Sandra is wearing a skirt made of safety fencing with woven fabric. The outfit is accessorized with fingerless gloves. Sandra, as an independent woman and artist, has always followed her own path. As with all of us, there are zigs and zags requiring a little support and courage now and then. With her safety netting, the fabric of life, and a positive attitude, she is on to a new path to WALK THIS WAY. Kathleen Foley, from Monument, Colorado, came here to model I AM THE STORM. Checkout her jacket, made from green wine bottle protector sleeves. When Darkness whispered to Kathleen that she would not withstand the storm, she stood with strength and courage and replied, “I AM THE STORM”. Now see her creativity ROAR. Miles of VHS Video tape, a catchy tune and a surprise. Here's Linda at her craziest. Need we say more?